Meetings are usually held on the second Saturday of each month, from 2.30pm – 5pm. Exceptions in red. For venue see top right-hand side of page. Stafford Music Festival 2017: In May, the Branch took part in the Stafford Music Festival, an annual event which brings a wide variety of live music to Stafford. 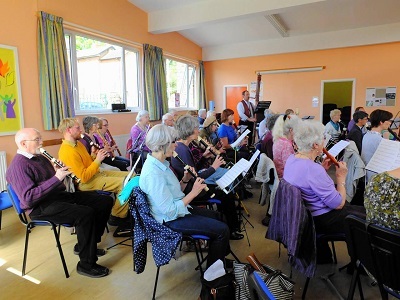 The idea was to hold an Open Workshop for recorder players to show what we do at a typical monthly branch meeting, and to encourage interest in the instrument generally. 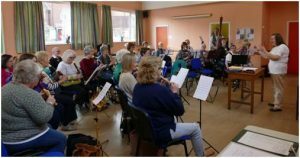 The venue was in the centre of Stafford rather than our usual meeting place in Penkridge, with visitors invited to join us and play, or simply listen. Nineteen of our branch members were joined by eighteen visitors, most of whom were non-SRP members. Tutor Alyson Lewin chose a good variety of music, beginning with something of her own, ‘Joe’s Jitters’, a fun, relatively easy piece which gave a relaxed start to the proceedings. Other works included ‘Step Stately’ – a Suite of English dances arranged by James Carey, and for double choir, the wonderful Canzon Duodecimi Toni (Hassler, arr. Greg Lewin). The afternoon concluded with ‘A Girl in Every Port’ (Alyson Lewin), a delightful way to finish with its catchy, well known tunes. 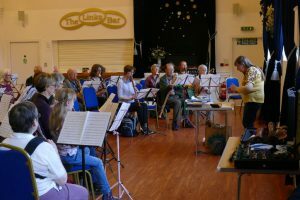 Visitors and members alike seemed to enjoy sight reading the music and working to improve the performance under the expert guidance of Alyson. There was the opportunity to socialise over refreshments which included some tempting home-made cake. It turned out to be a very pleasant afternoon and we felt happy with our contribution to the festival. OPEN WORKSHOP – Saturday 12th May 2018 at 2.00 – 5.00pm. Following on from our involvement last year in the Stafford Music Festival, we again opened our playing session to visitors free of charge. This year, however, it was held at our own branch venue in the Methodist Church Hall, Penkridge, Stafford, ST19 5AF. Alyson Lewin conducted a workshop to which there was an open invitation to any recorder players who wished to join us for the day. We worked on a variety of ensemble pieces from Renaissance fantasies to modern compositions and arrangements. A mixed bag of genres and styles! Another enjoyable day was enjoyed by all. South Staffs meetings are for anyone who can read music and enjoys playing the recorder. The playing of more than one size of recorder is optional. You don’t have to worry about holding a part on your own or playing solos. We don’t cater for absolute beginners, but can put you in touch with experienced teachers. The meetings are an ideal way to make contact with other players in the area. Age is no barrier – we have members from eight to eighty! New members and visiting players are always welcome. Membership fee includes an amount payable to the SRP, branch costs and a subscription to the quarterly Recorder Magazine. Visitor £5 ( free for first two visits) which includes refreshments. Our branch hosted the annual SRP Conference and Festival weekend which was held at Wolverhampton Grammar School on April 18/19th 2015.